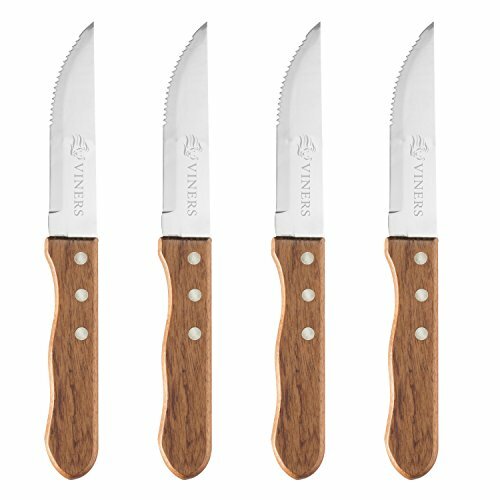 Perfect for contemporary table settings as well as traditional dinnerware, the Viners Rodeo 4-Piece Steak Knife Set is an elegant addition to any home, kitchen or dining room. Made from high-quality stainless steel, this set of 4 steak knives slices through steak, pork chops and more with wide, strong serrated blades. Durable and ergonomically designed, each knife is beautifully finished with a hardwood handle and finger grooves for added grip. This set of 4 knives comes packaged in a gift box and makes an excellent housewarming present or holiday gift. Dishwasher safe for easy cleanup. Immediately following wash cycle, remove knives from dishwasher and wipe dry with cloth to avoid water damage. Do not soak knives in water. Do not use abrasive scourers or silver cleaner on cutlery. Imported. With over a century of flatware manufacturing experience, Viners is a highly distinguished, trusted and much loved brand, steeped in British heritage. The illustrious flatware brand dates back to Sheffield, England in 1908. From a small silverware specialist, they grew to be the biggest silver, silver-plated and stainless steel kitchenware producer in the UK. If you have any questions about this product by Viners, contact us by completing and submitting the form below. If you are looking for a specif part number, please include it with your message.